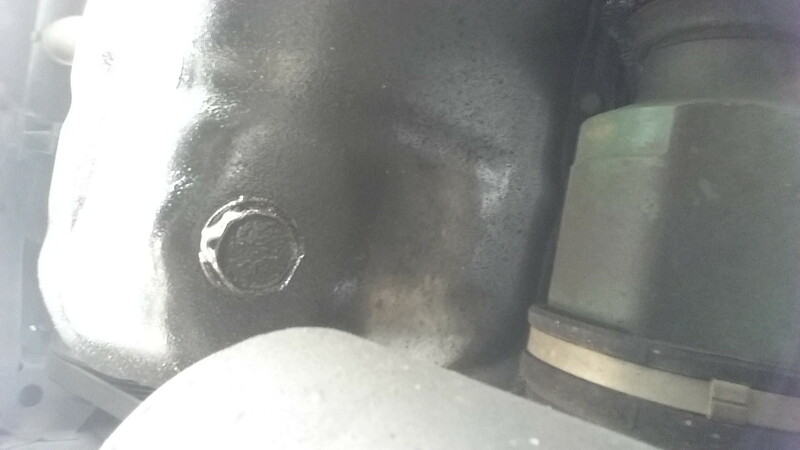 The normal car should not go much further than 10 000 km before changing the oil, especially if it is mainly driven in low speeds, like rush traffic. My car has passed nearly 20 000 km without me changing the oil, so it was way past due for some simple maintenance! 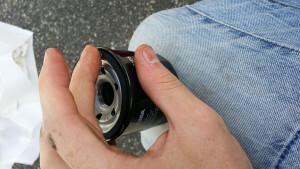 Neglecting to change oil and oilfilter may result in motor malfunction and/or the motor running badly. 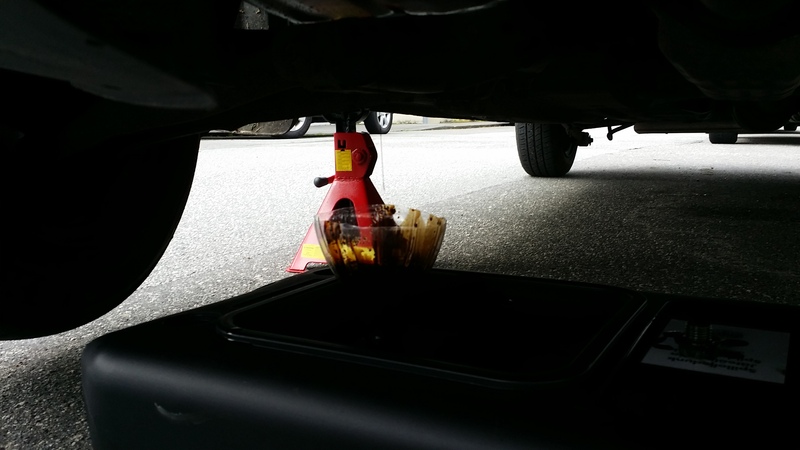 I am not a professional and attempting to change the oil and oilfilter on your own car is your own responsibility. I did this on my Mazda 323F GLX 2001, but the principle should be more or less the same for most cars. You should check your cars manual to find out what kind of oil you need and how much. The same goes for the oil filter. 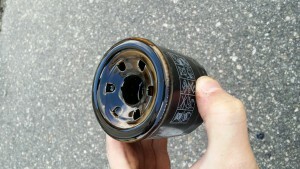 You can often ask for the right oilfilter based on your license plate number where you buy the filter. For my car, which run on 95 unleaded gas, I used 5W40 oil, and just about 3,5-4 litres of it. The jack stands are for keeping the car up on both sides at the same time and they are steadier than the jack that came with my car. 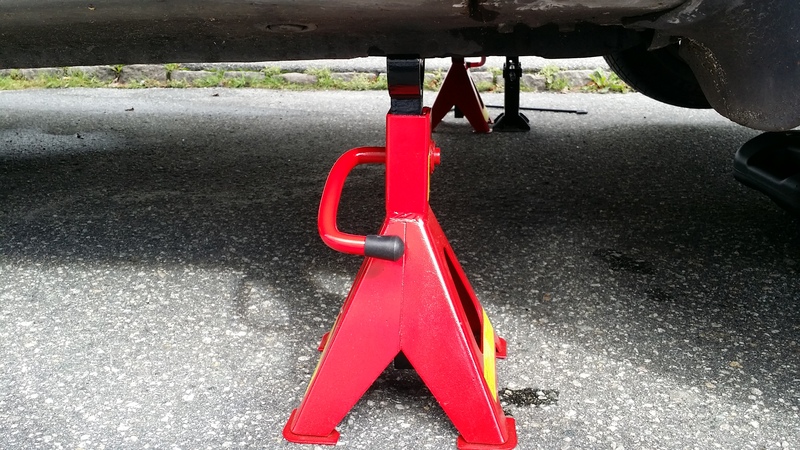 The important thing to remember when using the jack stands are to place them on a flat surface and to ease the car down on them. Also, check under the car for markings that indicate good places to place the jack. These are often marked or visible by having thicker metal. After lifting up both sides we’ll need to locate the plug that sits in the bottom of the oilpan. 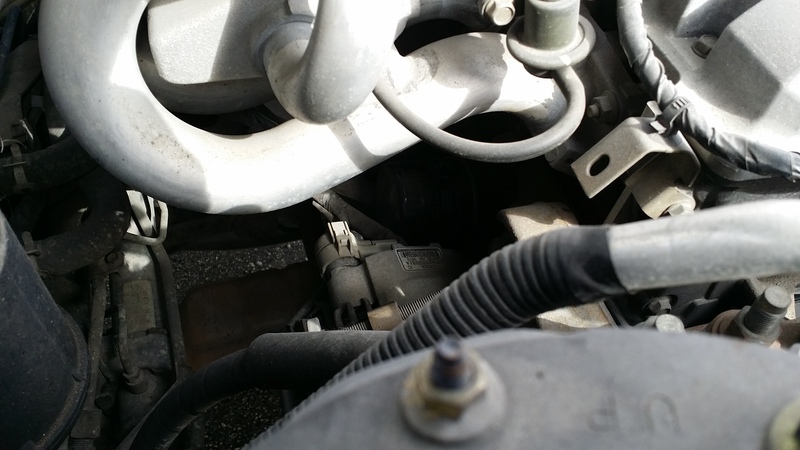 On most old cars it is a 19mm bolt, but some newer cars use 17mm. 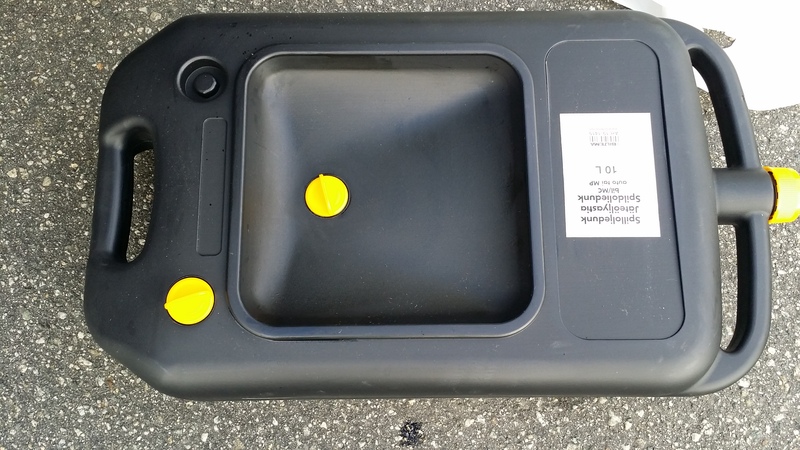 Now is a good time to find your spill oil canister. I didn’t have anything suitable, so I went ahead and bought one for this purpose. As you can see on the picture it has 3 yellow caps, and one of them (the one in the middle) is made so that oil that hits around it is directed to the opening. I recommend using a funnel anyways as old oil (and oil in general) is very messy and may leave bad marks on everything it touches. 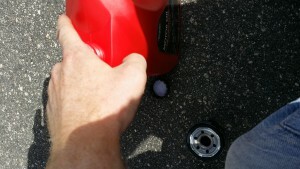 The next step is to place the canister beneath the plug and open the plug. Give it a little time to run of and put the plug back in when it’s done. Clean of any spill with some paper. 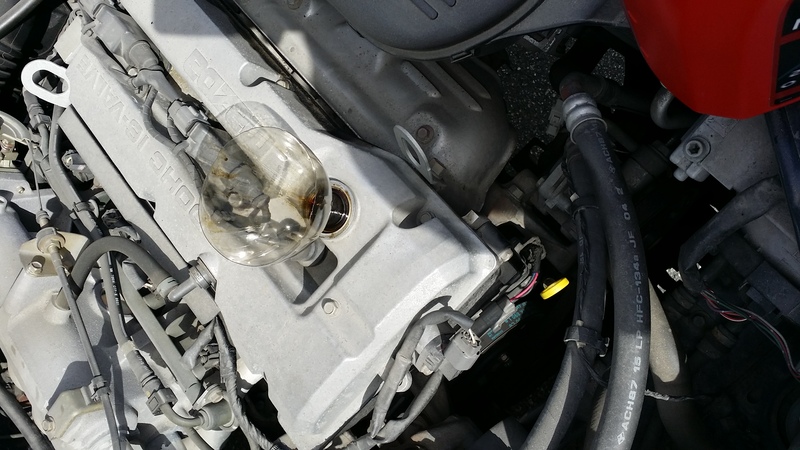 The car is now emptied for oil, and it’s time to change the focus to the oil filter. 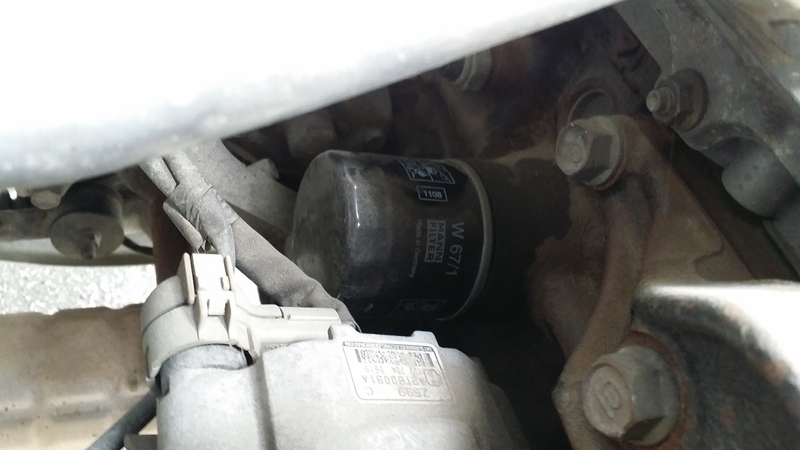 The location of the oil filter varies from car to car, but a quick google search or the cars manual should tell you where it is. For my car it is placed behind the motor, close to the torpedo wall. I was told by the guy where I bought the filter that I would need a plier for oil-filters. It would have made it easier, but I couldn’t get a proper grip on the filter with it because there was so little space. I ended up using raw force and grip power instead. The old oilfilter was filthy and ready for a change. Before I replaced the filter with a new one, I smeared some new motor oil on the rubber seal that makes the connection between the filter and the engine sealed. This is a tip I got from my grandfather to make the rubber less likely to crack and the seal tighter. After putting the filter back in place and making sure the plug in the oil tank was secured, I used a funnel to refill the tank with fresh oil. 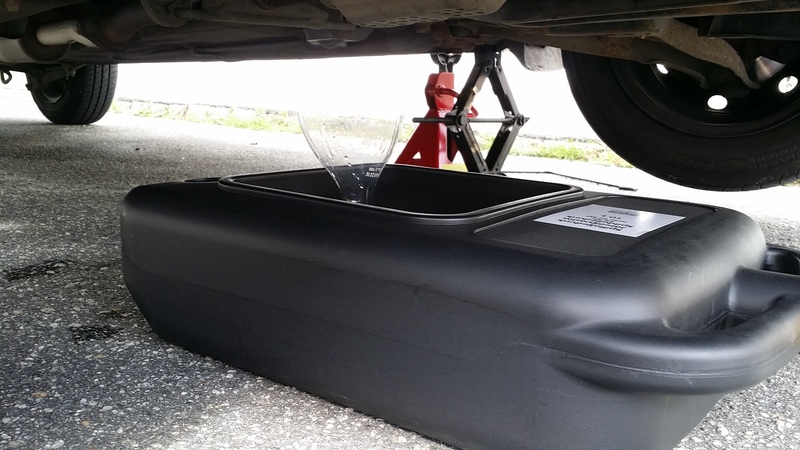 As stated earlier, I use 5W40 on my car, but check with your dealer or workshop to find one suitable for yours. The yellow thing down to the right of the center of this image is a measurement stick for the oil level in the engine. I used this to check that the oil level was in between the recommended levels after removing the jacks and putting the car safely on the ground again. 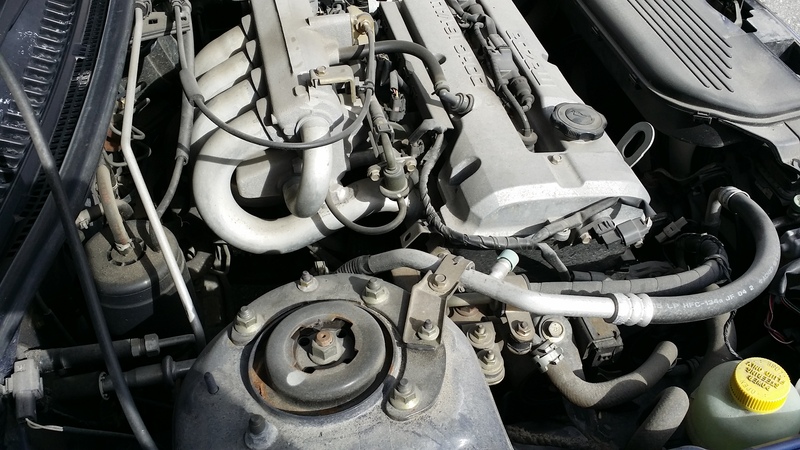 Then I gave it a proper test drive for a little while, and stopping to see if there was any oil leakage. I hope this was somewhat helpful. The exact execution of this operation might differ a little on some cars, but the general idea is the same. Let me know what you think in the comment section or on twitter!